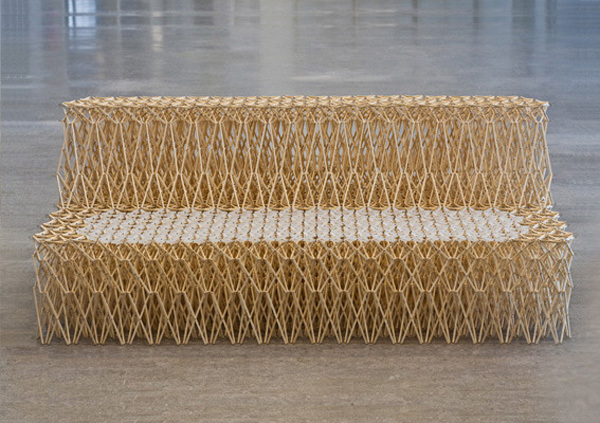 As a design student in the Netherlands, Yuya Ushida created the original Sofa_XXXX out of 8,000 recycled bamboo sticks (think chopsticks) for his graduation project in 2010. The expandable and contractible chair/sofa has since been produced using components that are injection-moulded from recycled plastic bottles and available in black or white. This version, available through Royal Ahrend is called XXXX_Sofa. Ushida has also come out with a stool version that only uses 600 parts and comes in a kit, not surprisingly named XXXX_Stool. This entry was posted in Art, Industrial Design, Just Plain Cool. Bookmark the permalink.